Another Bristol Race, Another Disappointing Finish For Martin Truex Jr.
Martin Truex Jr. can't seem to get a break at Bristol Motor Speedway. 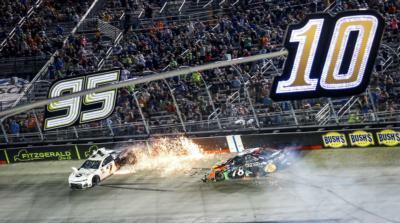 Truex, driver of the Bass Pro Shops/Ducks Unlimited Toyota, challenged for the victory at Bristol again, this time in the Bass Pro Shops NRA Night Race on Saturday. But again, he was denied. Truex has 19 victories and the 2017 championship in his Monster Energy NASCAR Cup Series career, but he has yet to win at Bristol. This time, he was running second with 69 laps remaining when Kyle Busch nudged him from behind, sending Truex's No. 78 Toyota into the inside wall. Truex finished 30th. "(Busch) probably could've shown a little bit more patience," Truex said. "He was a lot faster than me at that point in time. He just caught me and probably another lap or so he would've gone right by. Half his fault and half my fault for following the 14 (Clint Bowyer) for so long." Truex challenged Bowyer for the lead for several laps but couldn’t find a clean way to pass, so he rode in second. He regrets that decision. "I feel like I probably should’ve took the lead there," Truex said. "I probably should’ve bumped the 14 out of the way just to get the lead and I wouldn’t have been in that position. Sometimes you’re the nice guy and you get knocked out of the way. We’ll just have to race him a little harder next time." Truex showed his frustration over the incident when he threw a heel protector and then kicked the side of his car while it sat on pit road.